Best Things to Do in Cancun, Mexico! Known as the gateway to the Yucatan Peninsula, Cancun is often the first travel experience that most Americans have in Mexico. In fact up to 40% of American travelers are picking Mexico for their vacation. I’ll be the first to tell you that Cancun is not my favorite place in Mexico. There’s also the thousands of students who visit Mexico during Spring Break to party hard and get a tan — completely skipping any cultural experiences. 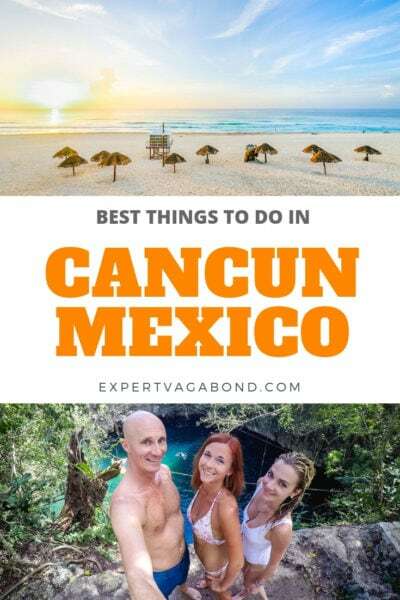 If you’re planning to spend some time in Cancun, I wanted to recommend some of my favorite fun and unusual things to do, no matter what time of year you visit. 28: Race An Exotic Car! Above you’ll find a map of highlights in Cancun, Mexico. Click on the top left of the map to find separate layers marking the route and points of interest. You can hide and show different layers, or click icons on the map to see the names of places I mention in this travel guide. “Star” the map to save it to your own Google Maps, or open the map in a new window for a larger version. Enjoy! Cancun is divided into two areas. 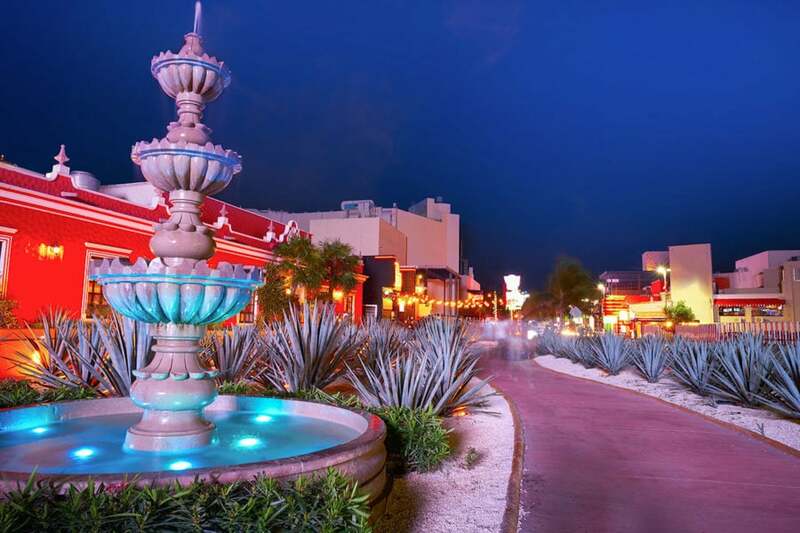 Downtown, also known as Ciudad Cancun — and Cancun Island, also known as The Hotel Zone or “Zona Hotelera”. The Hotel Zone is the primary tourist area, synonymous with resorts, catamarans, wild nightlife and beaches. It’s a 15-mile strip of sand shaped like the number seven. This is where most people stay. As the name implies, there are tons of hotels as well as most of the nightlife and beaches. Restaurants and bars line the only road, Kulkukan Boulevard, which runs from one side of the Hotel Zone to the other. If you get sick of the tourist Disneyland that is the Hotel Zone, Downtown Cancun provides a taste of local culture, with delicious street food, small shops, green parks, and Mexican Wrestling! Downtown Cancun (aka Ciudad Cancun) is the main residential area for locals too. This is where all the people who work in Mexico’s Yucatan Peninsula tourist industry actually live. Wander down to Avenida Tulum to see and experience the “real” Cancun. If you’re a foodie, make sure to stuff your face full of tacos from the vendors there. There’s a nice park too, called Parque Las Palapas. Snorkeling turquoise blue Carribean waters is an ocean activity you can’t miss while visiting Cancun. 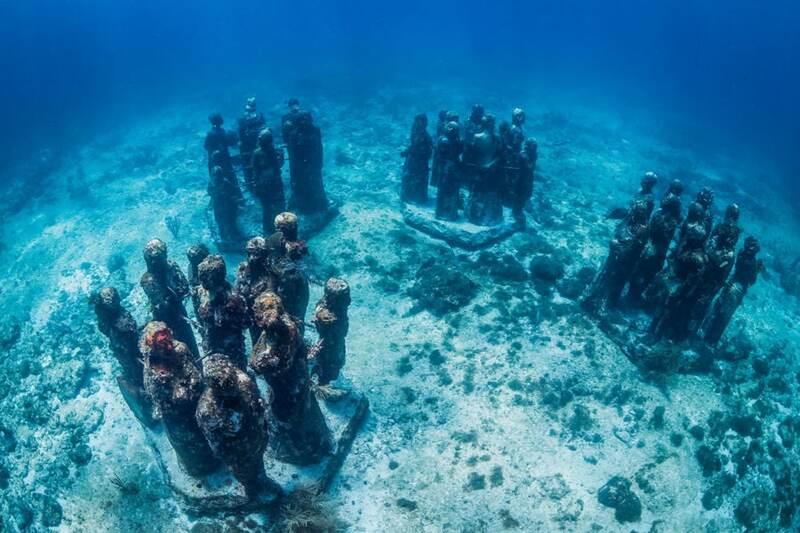 One amazing underwater attraction is the Underwater Museum — or MUSA. 500 sculptures were created from materials which encourage coral reef development. Huge hands, statues of locals and VW Beetles, the exhibits are surrounded by ocean wildlife giving you a really unique experience. MUSA continues to expand, as more sculptures are added, while the old ones are being eaten away by marine creatures. You can book a snorkeling tour directly starting at $30 USD. Mexico’s Yucatan Peninsula is famous for its amazing cenotes, natural pools formed in limestone caves. The entire Riviera Maya is covered with thousands of cenotes, many of them you can swim in. Cenotes are created when the limestone surface collapses, creating an opening into the Yucatan’s large underground river system. Most people visit them to go swimming, scuba diving or snorkeling. 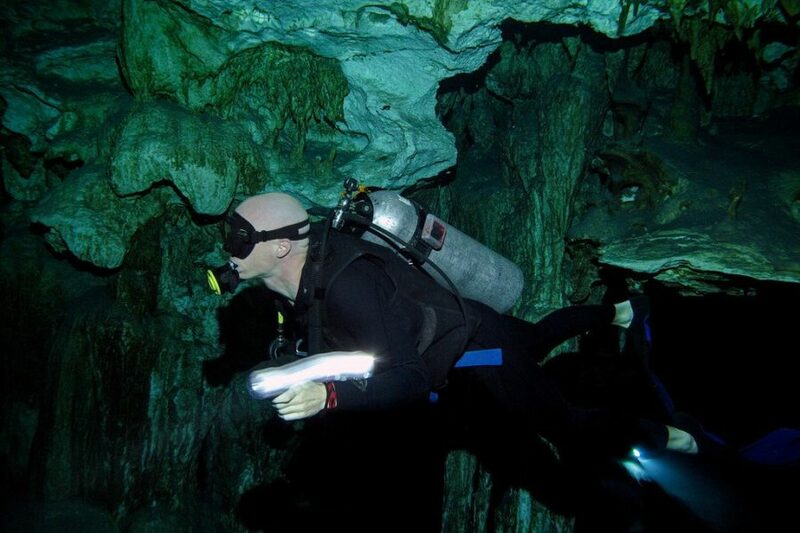 Some of the best cenotes near Cancun are located along the Ruta De Cenotes (Cenote Route) near the city of Puerto Morelos, about a 30-minute drive away. Here you’ll find Cenote La Noria, Verde Lucero, Cenote Mojarras, and Cenote Selvatica among many others. My favorite was Verde Lucero, which has its own zipline! A Tezmacal ritual is a traditional Mayan ceremony of purification which takes place in a tiny hut. 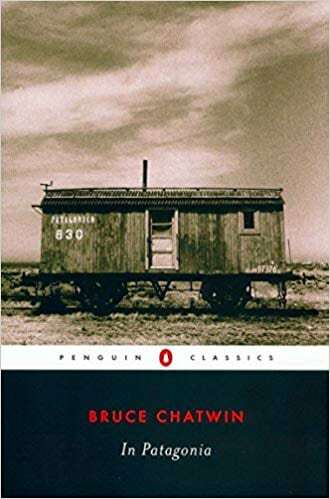 You strip down to your underwear (or swimsuit), then enter the sweat lodge which is heated with hot rocks & water, turning it into a steamy sauna. The ceremony is led by a local shaman, who conducts the ritual and takes care of participants. The tezmacal ceremony takes place in complete darkness, as the shaman pours water over the hot rocks, chanting and using different herbs to summon spirits. 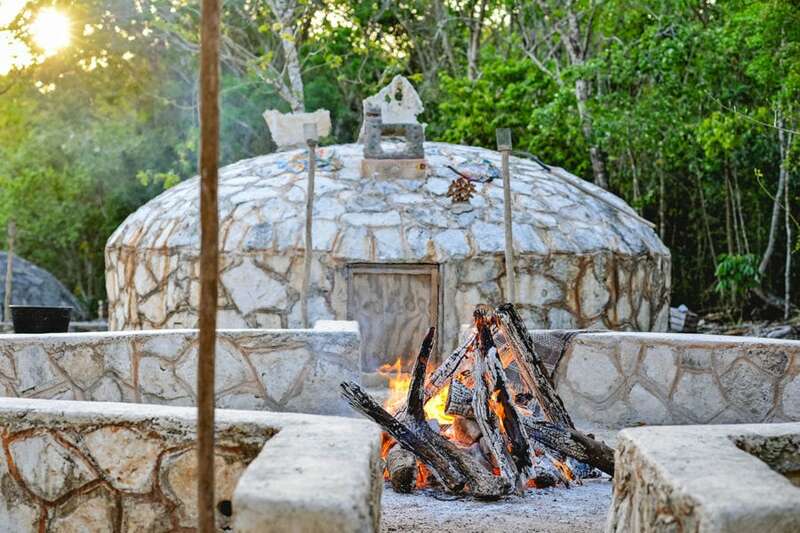 Temazcal was performed since ancient times, is seen as a purification ceremony that cleans the body, mind, and soul. As your body is sweating in the tiny hut, you enter a deep state of meditation, enhanced by the shamanic chanting. 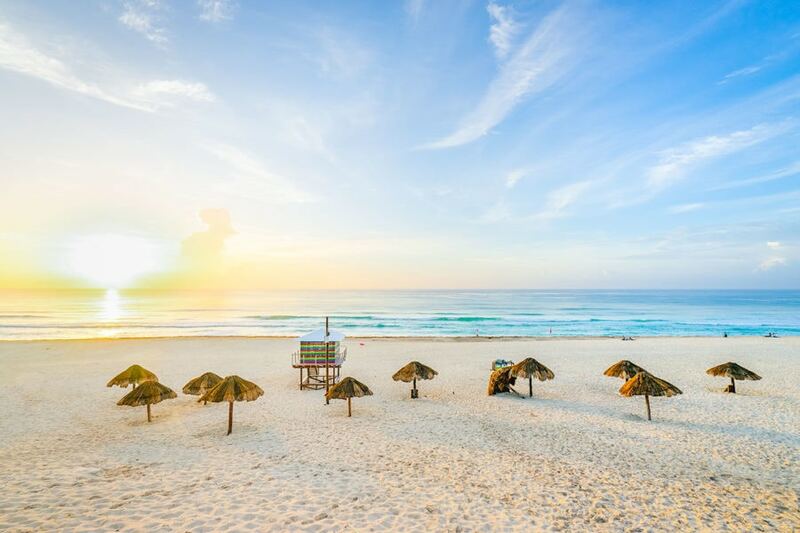 The 13 miles of Cancun’s coast is lined with Instagram-worthy beaches featuring soft, white sand, teal-blue waters and a cool breeze. The Hotel Zone has many beaches where you can relax and sip your margarita, but some of them really stand out, thanks to their beauty and atmosphere. Playa Delfines is one of the largest beaches in Cancun. 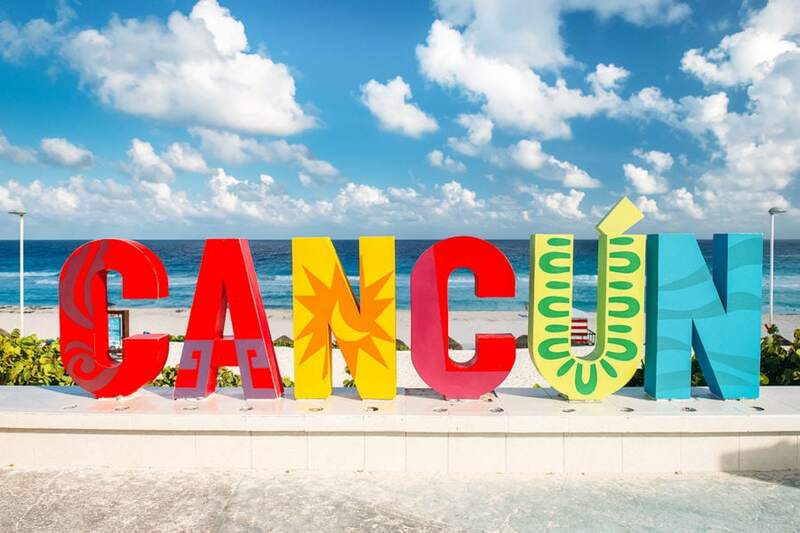 It is also known for the iconic Cancun sign and for being void of hotels or resorts, which makes it a local’s favorite. The currents are quite strong, so swimming is not advised. Playa Tortugas is best for families with kids, because it has small waves that allow swimming. The only drawback is the fact it can get crowded. You can enjoy a drink or seafood at the oceanfront restaurant. Chac Mool Beach is the perfect place to dive into the Caribbean waters. There are plenty of operators who rent water sports equipment, which makes this beautiful beach heaven for all water sports lovers. Playa Forum is the perfect mix between a vibrant atmosphere and a tropical retreat. It is located behind the most popular nightclub of Cancun, the Coco Bongo, this beach is filled with restaurants and bars. Zip lining is one of the hallmark adventures to do in Cancun, so you can’t miss it, even if you think you’re afraid of heights. In fact, it’s even better if you are! There are a couple of different theme parks near Cancun with zip lines. The closest theme park where you can enjoy zip lining is Selvatica. They offer multiple packages with 10 different zip lines. Xplor Adventure Park also has two zip line circuits, each with 7 different routes, with the highest point at 45 m (147 ft). All these adventure parks usually have other activities too, like ATVs and cenotes. The Maya city of Chichen Itza is a UNESCO world heritage site, famous for its amazing ancient pyramids. The oldest building in Chichen Itza dates from the 5th century. The most impressive structure of the city is the 98-foot tall pyramid Temple Of Kukulkan (aka “El Castillo”). The nine terraces around it symbolize the belief in a heaven with nine levels. Chichen Itza is well preserved so you can walk through history and get a glimpse of how the ancient Maya people lived. It’s located about 2.5 hours away from Cancun by car, or 3 hours by bus. The Cancun Scenic Tower (aka Torre Escenica) offers amazing views of the Caribbean coast, and Cancun itself. It’s open every day from 9am – 9pm. Hear about the history of Cancun as the tower slowly spins 360° for a spectacular birds-eye view of the entire Hotel Zone from the 100 m (300 ft) tall tower. The ride up takes about 5 minutes, and you can spend another 15 minutes taking photos as the deck spins around giving you views in all directions. 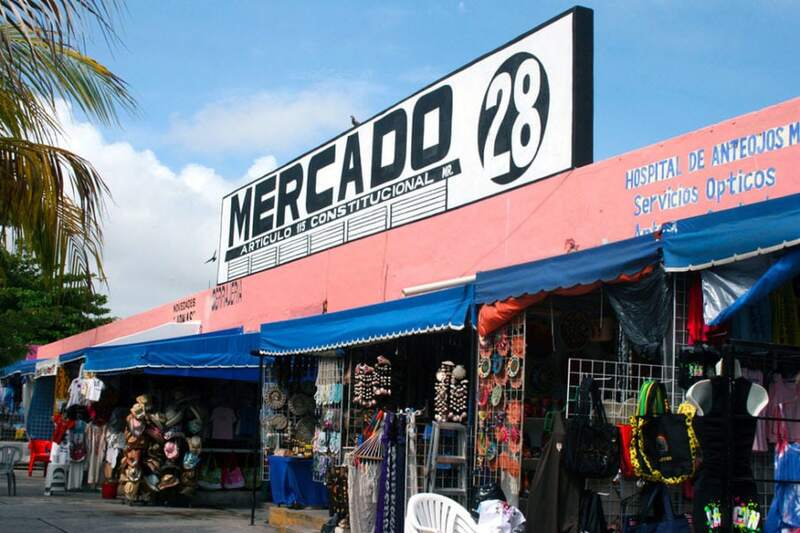 Mercado 28 (Market 28) is a huge shopping center in downtown Cancun. This isn’t your typical mall, instead, this giant flea-market boasts 600 vendors who sell pretty much everything. From textiles to maracas and leather items, you can find some cool Mexican souvenirs at Mercado 28. Many items are handcrafted and unique, so they make great travel gifts. Feel free to test your bargaining skills here. Resist the seller’s first price and you can walk away with a great deal. Stop by one of the local restaurants for food at a fraction of Hotel Zone prices too! Mercado 28 is easy to reach by bus from the Hotel Zone, but make sure you look for the Super Aki store, as there are several other markets with a similar name which can fool tourists. Ok, I can’t talk about Cancun without mentioning the nightlife. The city is known for its crazy nightlife, especially during Spring Break, when students travel to Mexico for a little fun. After a day at the beach, when sun goes down you can unleash your energy and dance the night away. The best nightclubs in Cancun usually have long waiting lines, but it’s worth the wait. Coco Bongo is the most popular club in Cancun. 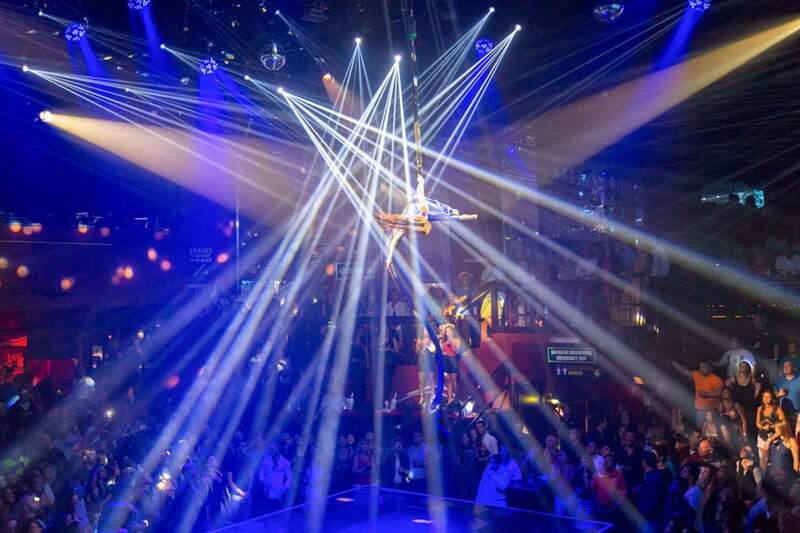 They have acrobats, cover bands and DJs who spice up the night. It’s kind of a mix between nightclub and Vegas show! The City Nightclub features celebrity DJs like Tiesto, Fergie and Paul Van Dyk who perform on a regular basis. With three floors and nine bars, the club can hold up to 5000 people each night. Mandala Beach Club is the place to go for a bikini party. This outdoor house music club opens daily at 9:30 PM, offering great music and delicious tropical cocktails. Dady O is the place to go if you are looking for techno and house music, professional dancers, light shows and body painting. The club has five bars and two floors where you can party until sunrise. Stand up paddle boarding is the latest trend in Cancun, but it is also a pretty easy and friendly sport that everyone can enjoy. You can rent your own paddleboard from the beach, or join a group trip to explore a certain area. If you are up for a challenge, join a long paddleboard tour that travels from Cancun all the way to Isla Mujeres! Other options are to paddle Nichupte Lagoon mangrove jungle or go on a sunrise wildlife tour. Looking to enjoy a traditional Mexico fiesta? Give Xoximilco a try! This is a Mexican party held on boats which travel on the canals near Cancun. It’s a theme park designed after the original Xochimilco in Mexico City, where families and friends rent out boats called trajinera and float down the water listening to live musicians. There is music, tequila, and delicious food, which makes Xoximilco a great way to taste local culture. During Xoximilco there is live music and people dance a lot. There are also many social games which keep the party going. The music and food come from different Mexico areas, which makes the party a colorful display of local culture. 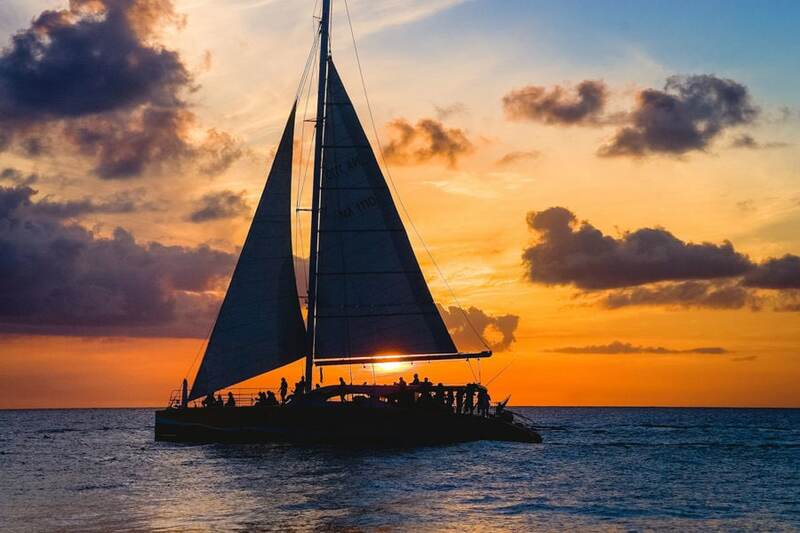 Mexico’s Riviera Maya and Isla Mujeres offer some of the most beautiful sunsets in the Caribbean and the best way to enjoy them is on a romantic sunset sailing trip off the coast. Board a sailing catamaran and watch the colorful sunset as the breeze plays with your hair. Most sunset sailing trips out of Cancun also offer an open bar and snacks, so you can sit back and relax. These journeys generally last about 2 hours, and companies offer a bad-weather refund if it gets too stormy or rough. Cancun is a haven for water sports enthusiasts and it’s the perfect place to learn scuba diving. There are many underwater attractions in the area. Cancun is located close to the Mesoamerican Barrier Reef, the second largest reef in the world. Home to dolphins, many kinds of tropical fish, eels, lobsters, nurse sharks, and majestic eagle rays. Isla Mujeres, the underwater MUSA museum, and nearby cenotes are favorite spots. There are several locations where newbies can learn scuba diving and get their PADI license. Isla Mujeres, which translates to “The Island of Women”, gets its name from the temple of Ixchel, the Maya goddess of fertility. This small island is only 20 minutes from Cancun by ferry from Hotel Zone. Isla Mujeres offers stunning views thanks to its rocky coast and gorgeous bays. It is also the first spot where you can see the sunrise in Mexico. 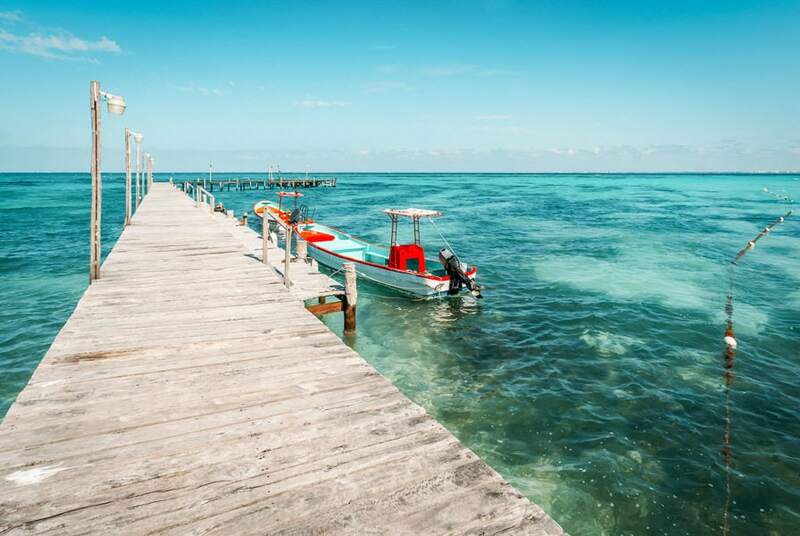 This sleepy fishing village offers a well-deserved pause from the crazy nightlife of Cancun. 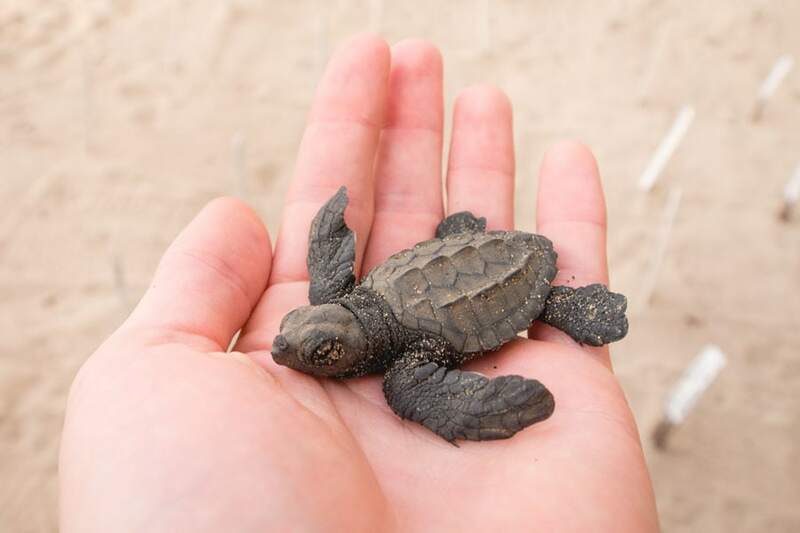 Watch sea turtles hatching at the local turtle farm and conservation center. You can drive around the island in a rented golf-cart, visit Ixchel temple, check out Garrafon Reef Park, go kayaking, snorkeling, or visit the 19th-century ruins of Hacienda Mundaca. Las Coloradas, or “the red ones” are pink lakes in a small fishing village with the same name. The lakes are part of a natural reserve which covers 150,000 acres and is home to a wide diversity of animals. 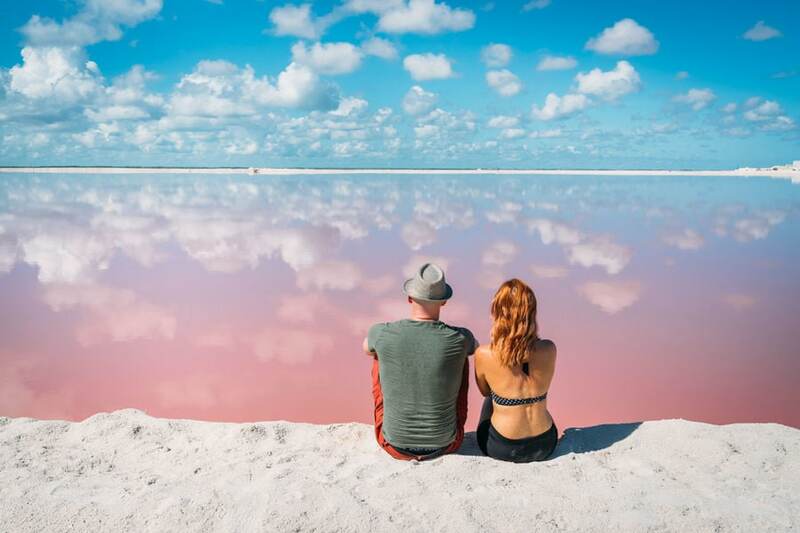 The amazing pink water is part of a salt processing facility, which is one of the main industries in the area, apart from fishing. The bright pink color of the lakes comes from red plankton and shrimp. Las Coloradas is a three-hour drive from Cancun by rental car. Travelers who decide to spend the night in the area can look for accommodation in Rio Lagartos, located 30 minutes away. Flamingo tours can be booked from Rio Lagartos too. One of the most touristy things you can do in Cancun is to get a picture with the colorful Cancun sign. Located on Playa Delfines, which is easily accessible by bus, the sign is one of the local landmarks. Once on Delfines, you can enjoy the local white sand beach, which remains one of the least developed beaches in the area. Just pay attention to the tides and warnings, as Delfines is known for strong currents, so you might want to skip swimming and stick with sunbathing. The view is spectacular and it’s my favorite beach in Cancun. Señor Frogs is the stereotypical place to go drinking in Cancun. Here you will find a lively atmosphere, where everyone is singing and dancing, plus you can eat there too. There’s sawdust on the floor and the walls are covered with funny signs. They serve drinks in massive “yard” glasses, and a Conga line could break out at any moment. You can also bring kids if they are above 8 years old – but it’s not appropriate for smaller children, as there is a lot of noise and people who party hard. One of the popular things to do in Cancun is riding All Terrain Vehicles (ATVs) through a dirt road jungle route. There are many companies which offer ATV tours of the jungle, one of them being Xplor Park. The ATV ride is included in the all-inclusive park entry fee of $120. You can spend a whole day there going cave swimming, rafting and zip lining, plus there is a lunch buffet and unlimited drinks. Xplore is just one of Mexico’s many popular “adventure theme parks” located South of Cancun. Some of the others include Xcaret, Xel Ha, and Rio Secreto. 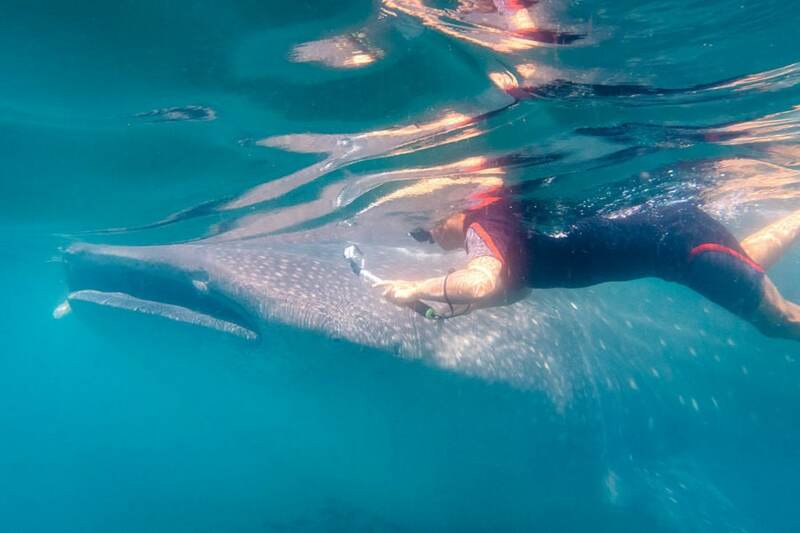 The Whale Shark is on the endangered species list, so having the opportunity to swim with these magnificent creatures is going to leave a strong impression. The Yucatan peninsula is one of the places where you can swim with these large harmless creatures – an adult can reach 12 m long and can weight up to 20 tons, making them the largest known fish. Baby whale sharks are very playful and known to play with swimmers. The best time to swim with the sharks is between June and September. Tours leave from Cancun, Isla Mujeres, or Isla Holbox. Watch some Crazy Mexican Wrestling! Lucha Libre is a unique Mexican cultural experience in Cancun. There are two fighters, the good and the bad, who use a mix of wrestling, acrobatics and theatrical maneuvers in an attempt to win. Fighters wear masks and are sometimes accompanied by little-people and drag-queens. Each fight lasts about three rounds and usually ends with someone thrown outside the ring. 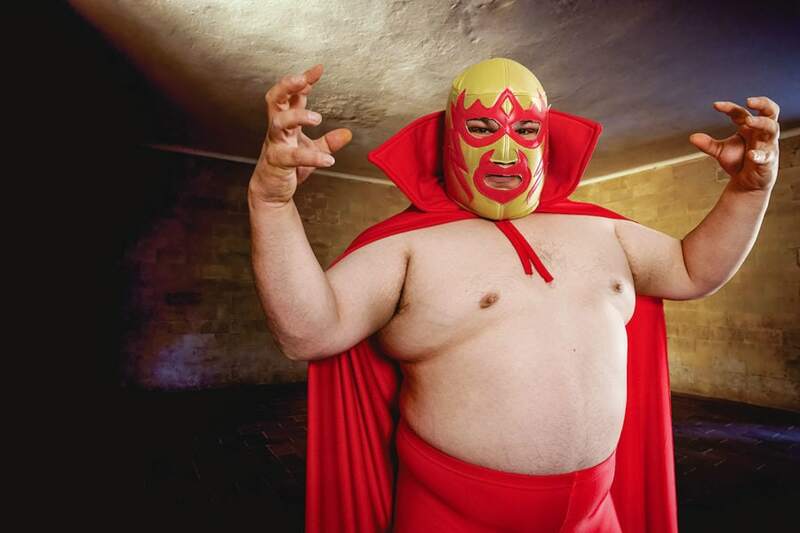 Lucha Libre events are held downtown at Arena Cancun every Tuesday, Friday and Sunday night. A front row seat costs about $12 USD with beer and snacks available for sale. It’s quite a show! Beaches near Cancun are some of the best places in the world to find sea turtles. Between May and October you can see the turtles lay their eggs on the beach. The little ones hatch and flop into the ocean from July – December. The best place to visit sea turtles is Tortugranja, the turtle farm and conservation center on Isla Mujeres. Green turtles, hawksbill and loggerhead turtles are the most common species you can see around Cancun and Isla Mujeres. At Tortugranja you can see turtles all year round, in every development stage, for a $3 fee. You can feed them and interact with them under the care of a guide as well as crabs, urchins, and conches. Museo Maya Cancun and San Miguelito Ruins cover 80 hectares in Hotel Zone. The new museum opened in 2012 with all kinds of cool Mayan archeological relics. 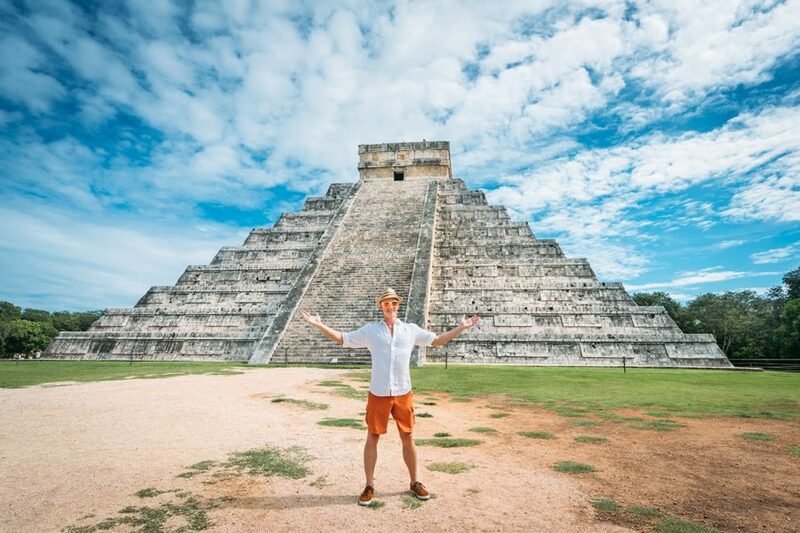 You will be able to walk among ruins, see ancient skeletons, jade relics, and artifacts from Chichen Itza and other Mayan sites around the Yucatan peninsula. There are three galleries where you can discover multiple elements from Mayan history and culture. The ticket costs about $5 and grants you entry to San Miguelito ruins, which is a spread of temples, pyramids and family homes of Mayans, set in the jungle. Isla Contoy is a bird watcher’s paradise. The small protected National Park sanctuary North of Isla Mujeres is home to more than 100 species of birds and 4 species of sea turtles. The tropical breeze and bird spotting complete this amazing tropical heaven. Once here you can relax and just take some pictures of the wildlife, before picking up your snorkeling gear and dive into the clear waters. 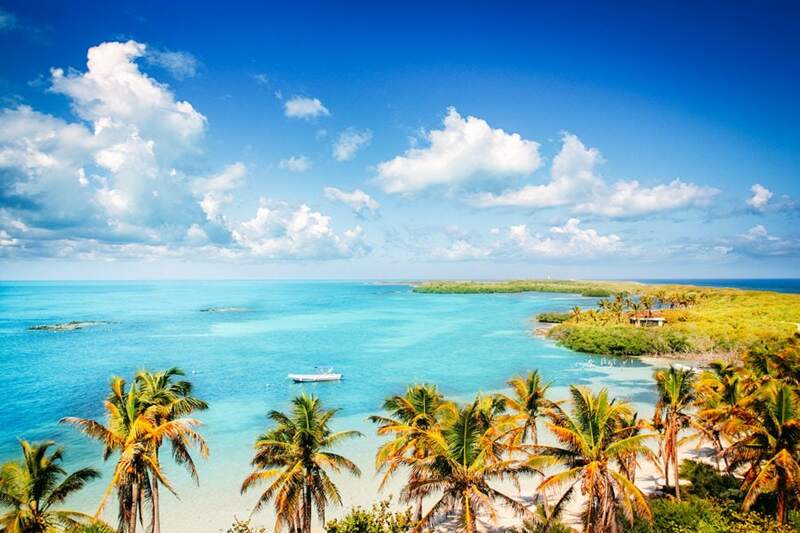 Isla Contoy can be reached via an all-inclusive cruise at the cost of about $100 per person. To keep the inhabited island in pristine condition, tourists have to follow very strict rules and pick up after themselves. Nichupte Lagoon is an enormous body of water made up of 5 different lagoons called Nichupte’, Río Inglés, Rio del Amor, Caleta Nizuc y Bojórquez. You can go kayaking and paddleboarding here. It’s the only natural ecosystem that remains after the construction of Cancun’s huge Hotel Zone. The waters are surrounded by jungle paradise, heaven for bird watchers and biologists. The fresh water coming from the rocks underneath mixes with the salt water from the sea offering a comfortable, prosperous and protective environment for many speices of fish to reproduce. 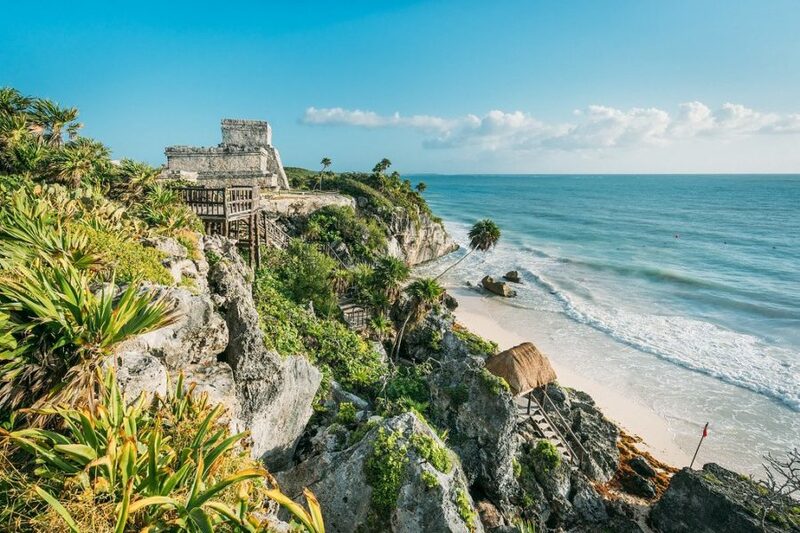 If you’re visiting Cancun, you probably shouldn’t leave without stopping by the town and Ruins of Tulum, one the largest cities built by the Mayans. This former port city is home to some of the best beaches in Mexico, as well as beach clubs and yoga retreats. But the highlight is the ancient walled city perched on the edge of a cliff overlooking the Caribbean ocean. Tulum was a major trading and religious center between the 11th and 16th centuries, and is one of the coolest Mayan archaeological sites in Mexico. Make sure to bring your swimsuit and visit the hidden beach! Race Fancy Cars in Cancun! Need a jolt of adrenaline? What would you do if someone handed you the keys to a $200,000 exotic luxury car and told you to drive it as fast as you can? Drive it like you stole it, of course! That’s just what you can do at Exotic Rides Cancun, where they rent out luxury and exotic cars and teach you how to drive them around a race track. You have your choice between a few different models, including the Ferrari F430, Lamborghini Murcielago, Lamborghini Gallardo, Audi R8, and Mercedes-Benz SLS AMG. Woooooo! Stuff Your Face with Tacos! 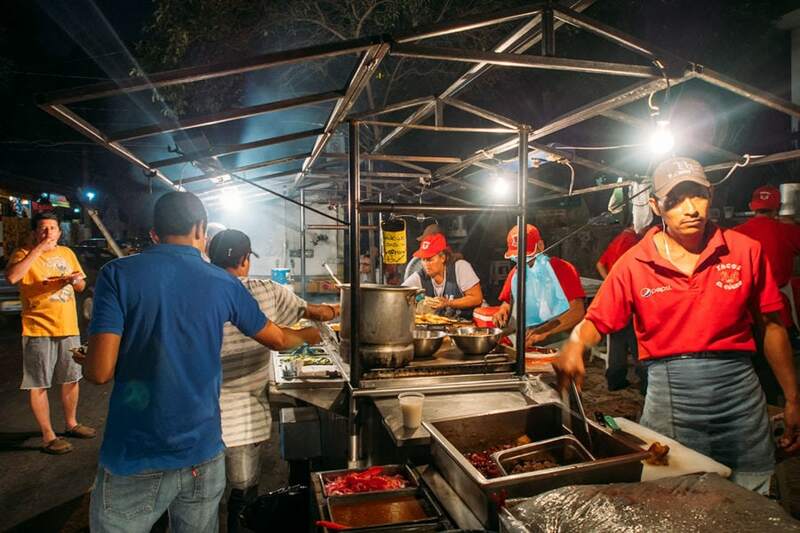 No trip to Mexico is complete without a thorough vetting of Cancun’s tastiest taco stands. You’ll find all the best tacos away from the Hotel Zone in Downtown Cancun, on Avenidas Tulum and the Parque Las Palapas area. Make sure to order some Tacos al Pastor, the classic Mexican-shawarma style pork meat taco featuring a pineapple slice on top. The pork is marinated in a combination of dried chilies, spices, and pineapple. My favorite! This type of meat was actually created by Lebanese immigrants, but it’s since become the Mexican standard. You can also try tacos with beef, chicken, shrimp, and if you’re brave, even cow brains or udder. 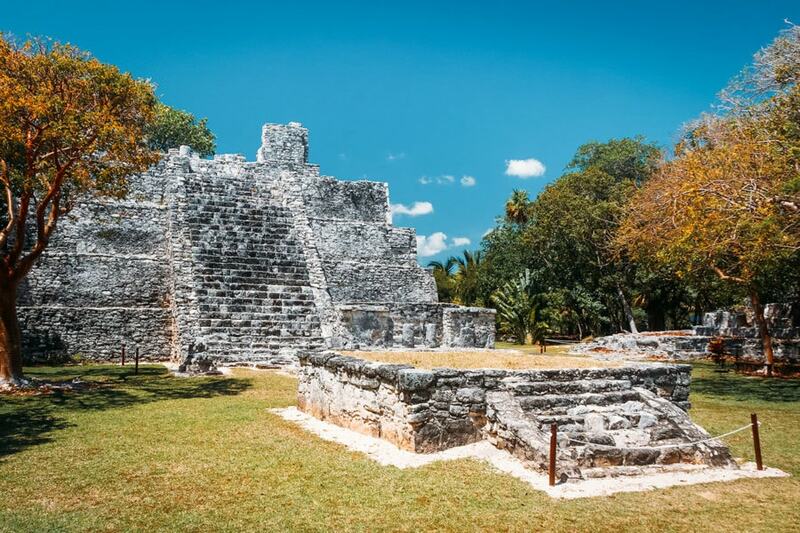 El Meco is a set of ancient Maya ruins that aren’t well known about, located North of Downtown Cancun. There’s even a 41 foot high pyramid! These ruins were probably related to Isla Mujeres and an important port for the Maya in the Yucatan Peninsula. To find them, head up Avenida Lopez Portillo (aka the Cancun-Puerto Juarez road) in a rental car, taxi, or collectivo bus. The site is located at KM 27. The ruins are just off the road on the left. High season for Cancun is during the winter from January to March, when all the snowbirds from Canada and the United States come down to escape the cold. This is when you’ll find the best weather and the least amount of rain. But it’s also the most expensive and most crowded season. March is typically when Spring Break madness happens. The best time to visit Cancun for families with kids is from April to November. 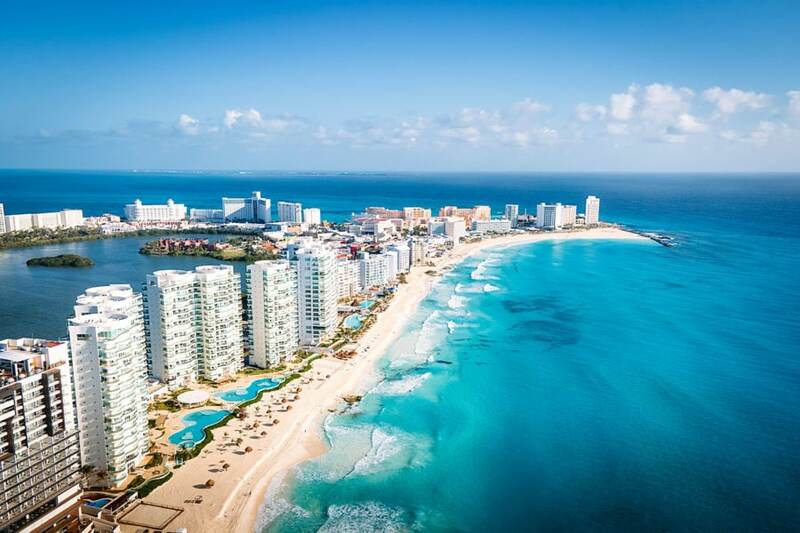 If you are looking to travel on a budget, visit Cancun during the rainy season, from July to October. Most people get to Cancun after flying into Cancun International Airport. From there, you can book a private shuttle or take the public ADO bus (much cheaper). Buses leave every 30 minutes and cost about 72 pesos ($4 USD). Discover Car Hire searches all the big car rental companies and finds the best price. This is probably the easiest way to rent a car in Mexico. There are regular ADO buses that will take you all around the Yucatan Peninsula from the ADO Cancun Bus Station. Buses are comfortable and safe. The cheapest way to get around Cancun is to take a collectivo (group taxi). These are what the locals use to get around the city, but routes can be confusing if you don’t speak Spanish. Taking a taxi is what most tourists do, but beware that the Yucatan has a “taxi mafia” that charges high prices whenever they think they can get away with it. Always settle on the price before getting in. How safe is Cancun? Well, I’m sure you know Mexico has some drug cartel problems. The gangs are active in Cancun, but tourists usually aren’t targeted. Avoid buying drugs and you won’t have any issues. Stay up to date on all the most common travel scams and follow practical travel safety tips to avoid petty crime. Mexico is cheap, but Cancun is relatively expensive. 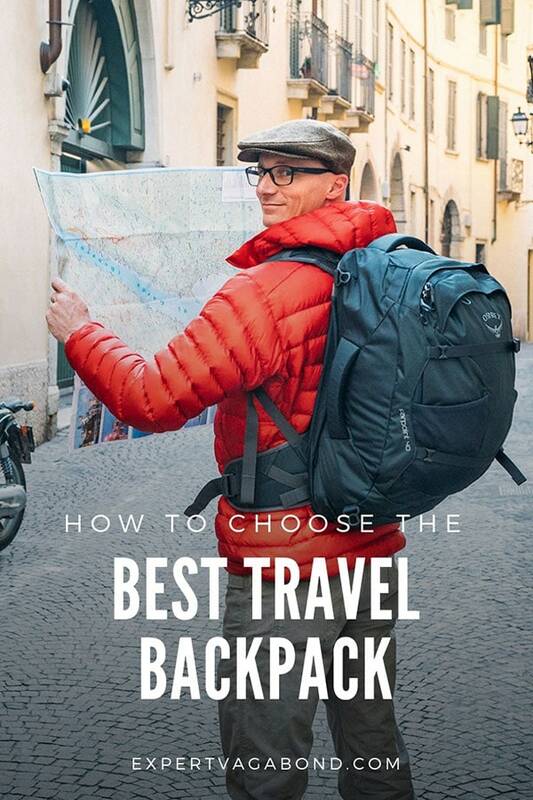 Save money by eating out at local taco stands, getting out of your resort, and renting a car to explore on your own. Don’t worry about the water in Cancun, that’s an old myth. Drinking water is treated locally and then often treated again at hotels or restaurants. For some culture, May 5th is the Cinco de Mayo festival, celebrating Mexico’s 1862 Battle of Puebla victory. Visit in October for the Cancun Jazz Festival. Have any questions about things to do in Cancun? What about other suggestions? Drop me a message in the comments below! Wow! that’s amazing…something I was looking forward to. Thanks for sharing. Beautiful Cancun, my go- to holiday destination all the time! OMG this post is a great piece, so many things to do! I would go for sailing during sunset for sure, it sounds amazing. Beaches look not bad as well, as for Mexico beach it’s a must! Mexico has some great white-sand beaches for sure! This is perfect. I’ve been all over Mexico but never made it to Cancun. The party vibe isn’t really my thing. I like how you focus more on the cultural things to do in Cancun instead. I’ll skip Senor Frogs for time with the turtles any day! 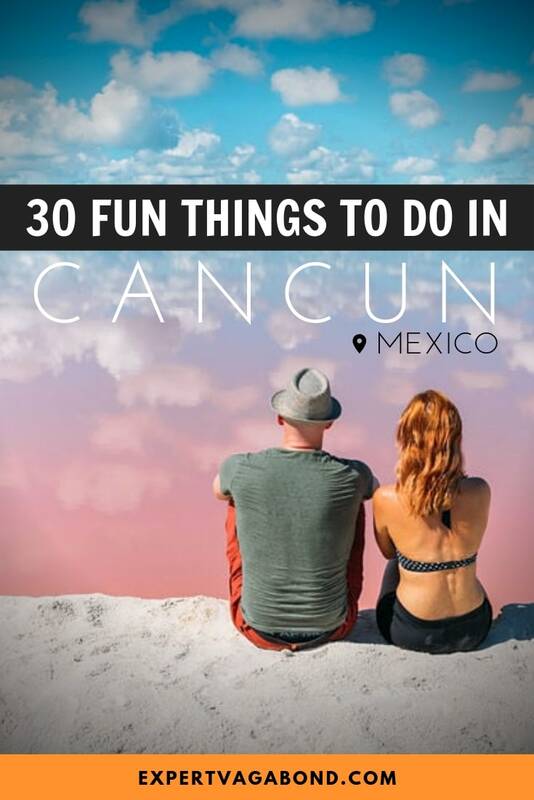 I think most people there are looking to party or sit on the beach, but there are so many other cool things near Cancun! It’s at least worth joining a few cultural experiences — otherwise, they basically could have just gone to Miami! There’s much more to Mexico than beaches and clubs.